Dr. Aqil Inam did his F.Sc. (pre-engg.) from Government College University Lahore followed by B.Sc. Metallurgical Engineering and Materials Science from U.E.T Lahore in 1998. Professionally he started his carrier by serving various industries in Lahore and Sargodha. Later he joined the University of the Punjab as a research scholar in 2001. Little after he got inducted into the faculty as lecturer in 2002 in the department of Metallurgy and Materials Engineering, University of the Punjab, Lahore. 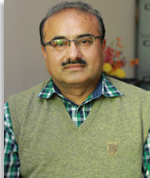 Dr. Inam improved his qualification with flying colors; first Master’s degree from Institute of Chemical Engineering and Technology, University of the Punjab and then accomplished doctoral studies from University of Leeds, UK. After completion of Ph.D. studies from University of Leeds, UK, he came back to University of the Punjab and appointed as assistant professor of metallurgy in 2013. In his Ph.D. project Dr. Inam successfully developed a new composition of free-cutting steel known as “Graphitic Free-cutting Steel” for a tangible support to auto parts industry. Dr. Inam has completed number of research projects in collaboration with industries. He has published number research articles in national and foreign journals of international repute. Currently Dr. Inam is working on various research projects in ferrous and non-ferrous metallurgy. He is actively engaged in strengthening of metallurgical laboratories of the department.